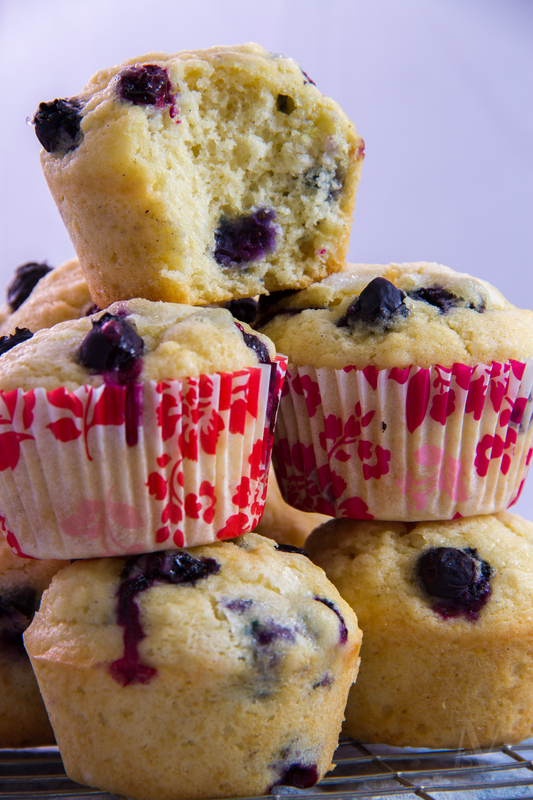 Once upon a time, I baked a beautiful batch of Blueberry-Vanilla Bean Muffins. I used my favorite blue flowery muffin liners, selected the prettiest muffins (not without a touch of mother-like guilt for the rest of the still-beautiful-in-their-own-way rejects), and coerced my favorite photographer into capturing them on camera. My favorite photographer and I happen to share a home, birthday, and set of parents, which makes picture-taking quite convenient. We have a great system, Sam and I: I bake delicious treats, Sam takes pictures of them, and then he is paid in baked goods. Pretty much a win-win situation. So, these muffins began just like any other recipe for my blog. Bake, cool, photograph. But then trouble happened. A few days after taking the pictures I started a new blog post, typed up the muffin recipe, and asked Sam for the SD card with the blueberry muffin pictures on it. It turned out that Sam had taken pictures for a wedding the day after photographing the muffins, and somehow his camera card had cleared itself and stored the wedding photos over the muffin ones. Too bad, so sad. But seriously. I went along with a different post (luckily I was ahead of the game and had a different treat ready to go) but I didn’t forget about the muffins. I knew that I must share them with you. So unfortunately, I had got to make them again. Guess it wasn’t so bad after all, since I ended up with another batch of fabulous muffins! Plus it gave me a chance to make a few little adjustments. The first time around, I found myself out of vanilla extract halfway through the recipe. Usually whenever this happens I cry a little inside since I’m a firm believer that vanilla is always ALWAYS necessary, but this time I remembered the trillion-dollar Madagascar vanilla beans hidden away in my pantry. I had been planning on using them for an extra-special recipe, but then I thought about it and decided that life is too short to let the vanilla beans hide away in a cupboard waiting for the perfect occasion. Every occasion is perfect; every recipe is special! (Please excuse the cheesiness.) In short, I used those vanilla beans and I used them good! Back to the muffin adjustments…even though the second time I made them I had plenty of vanilla extract, I kept remembering how wonderful the first batch was with the vanilla bean seeds. There’s something so alluring about those little black flecks mixed into thick batter, and they add such incredible flavor. I still had half a bean left over from the original muffins so I scraped it clean and added those seeds right into the mixture! For the second batch I also reserved 1/2 a cup of blueberries to sprinkle on top right before baking so that they weren’t covered up with batter. I like to really see those dark juicy berries on top of the muffins, you know? Makes them more eye-catching. All in all, I guess it wasn’t so bad to have all the first pictures erased. These muffins are totally worth making again and again. 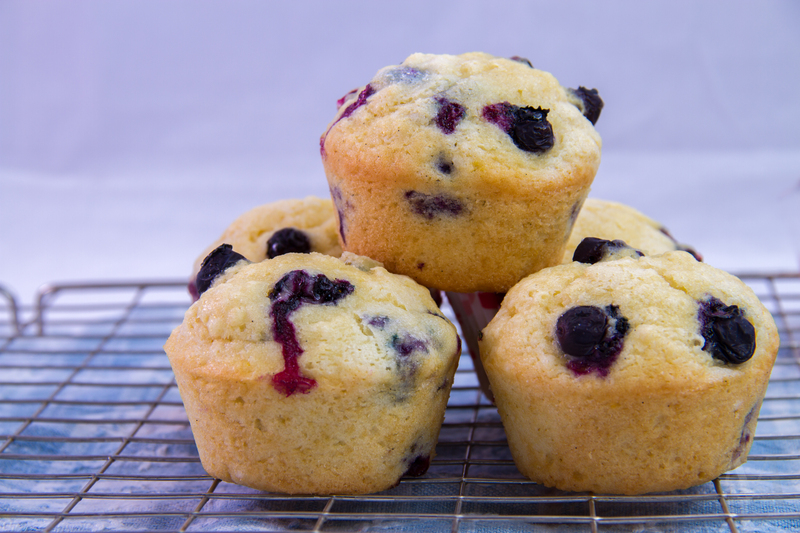 They’re some of the best darn blueberry muffins I’ve ever had…perfectly soft, sweet, moist, vanilla-y (if that’s even a word), and of course bursting with fresh blueberries. Now that I think of it, Sam’s word is the only evidence I have for the mysterious wipe-out of those first pictures…could it be that he was willing to tell a little white lie if it meant getting to eat more blueberry muffins? Perhaps we’ll never know. Preheat oven to 425 degrees F. Grease or line 15-16 cups in a muffin tin and set aside. In a large bowl, whisk together the flour, baking powder, salt, and cinnamon. In a medium-sized bowl, whisk together the eggs and sugar until smooth. Whisk in the buttermilk, oil, and vanilla beans (or vanilla) into the egg mixture until well-combined. Pour the wet ingredients into the dry and stir gently, just until no flour streaks remain. Be careful not to over-mix! Batter will be thick and slightly lumpy. Fold in the blueberries, reserving 1/2 cup. Evenly spoon the batter into the prepared muffin tins, filling almost to the top (again, you will have 15-16 muffins). Top with remaining blueberries and sprinkle with coarse sugar if desired. Bake for 5 minutes, then decrease the oven temperature to 375 degrees and bake for an additional 13-15 minutes. When the tops bounce back lightly when touched and an inserted toothpick comes out clean, take the muffins out of the oven. Let the muffins cool for 10 minutes in the tin, then carefully remove to a cooling rack. Enjoy immediately or store in an airtight container for up to 5 days. Back in my early baking days, before Pinterest and food blogs and reasonably fast Internet and a computer that didn’t have a gigantic egg-shaped bulge in the back, I used actual cookbooks. Cookbooks, handwritten recipes scribbled on notecards, and the recipes printed on the back of ingredient bags/boxes were the most common sources of all my recipes. When I had the urge to bake chocolate chip cookies, I simply flipped over the bag of chocolate chips and followed the traditional Tollhouse recipe. The recipe for my favorite soft gingersnaps was found in a homemade, spiral-bound cookbook given to my dad from a past student, and the recipe for my grandma’s famous Crown Jewel Cake (aka Lady Finger Cake) was handed down to me, handwritten of course, from her mother-in-law. I had it in my head that there was one, maybe two, tried-and-true recipes for whatever I wanted to bake. My little baking world offered fewer choices, fewer variations, and less of an urge to produce the perfect this-or-that. Which was both good and bad, I suppose. Sometimes I think I get a bit carried away with all the spunked-up versions of traditional baked goods that float around the Internet, searching tirelessly for the perfect chocolate chip cookie, the perfect blackberry pie. However, sometimes all that searching, that endless supply of online recipes lying at my beck and call, leads me to a jackpot. 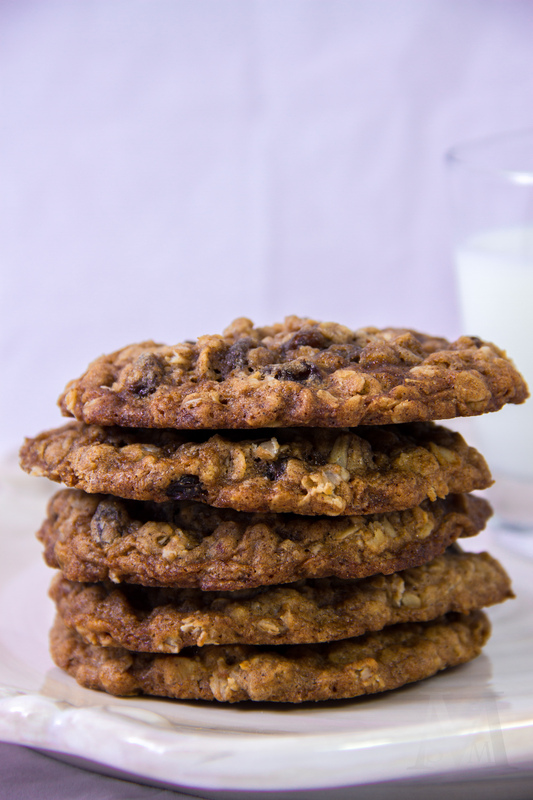 Oatmeal-raisin cookies have been one of my favorite stand-by cookies since the beginning of my baking career. For years I used the recipe for Vanishing Oatmeal Raisin Cookies conveniently located on the underside of a Quaker Oat canister lid. As my baking skills grew, my cookies changed from dry, slightly-burnt lumps or flat, greasy circles to perfectly tasty, chewy, cookies. I had nothing to complain about, so I never used any other recipe. Until now, that is. 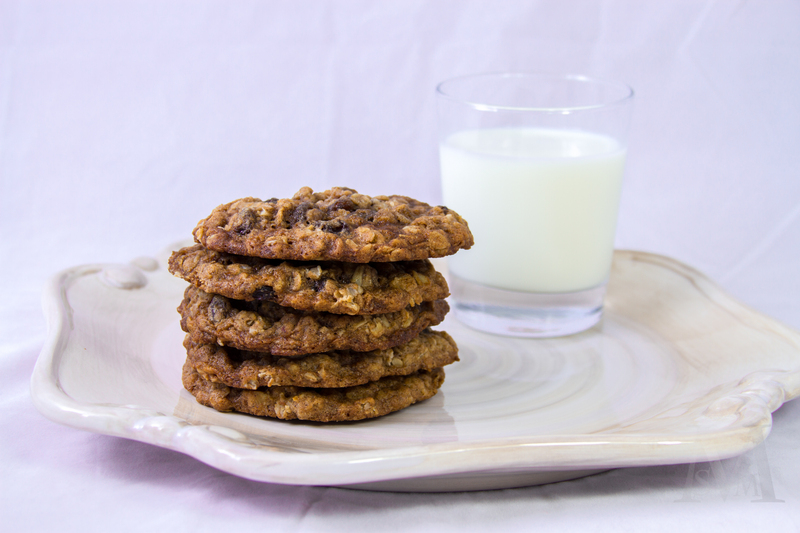 Sadly it seems as though oatmeal-raisin cookies are hardly a favorite of the cookie family. So often they get passed up for chocolate chip, peanut butter, white chocolate macadamia, or other more “exciting” cookies. After coming across a recipe on Annie’s Eats for “The ultimate” oatmeal-raisin cookies, I knew I had to try it. This was definitely a recipe that had been tested over and over, especially since it called for weighted ingredients. I’ve simply listed the measured amounts below, since I don’t happen to be the lucky owner of a food scale, but you can view the original recipe from the link at the bottom if you’d prefer to weigh your ingredients. 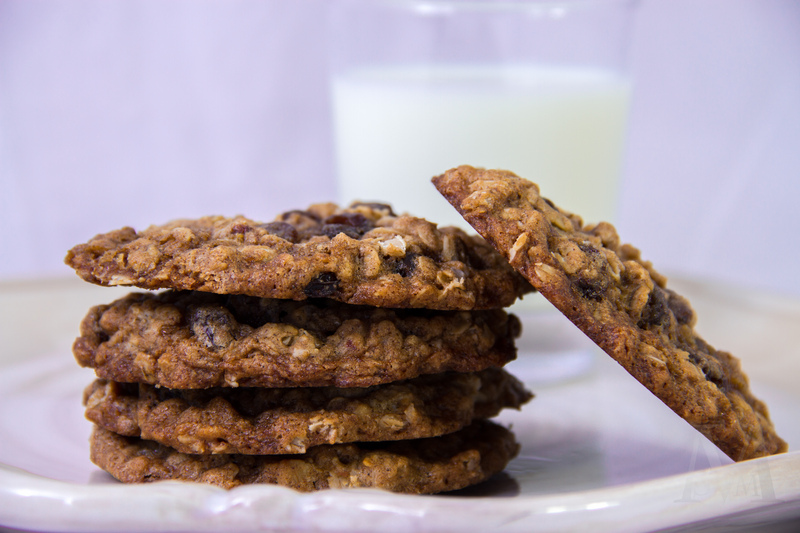 These really may be The Ultimate Oatmeal-Raisin Cookies. With an entire tablespoon of cinnamon, a vanilla bean (which is worth the splurge!) plus a tablespoon of vanilla extract, rehydrated raisins (just soak ’em in some hot water to get them plump and juicy) and carefully proportioned ingredients, this recipe is above and beyond that of the oat box’s. Sorry, Quaker Oat Man. Though I’m admittedly a lover of thick & chewy cookies, these fall more into the thin & chewy camp. Just as long as you’re careful not to over-bake them they won’t be crunchy, just crisp around the edges and wonderfully chewy in the center. 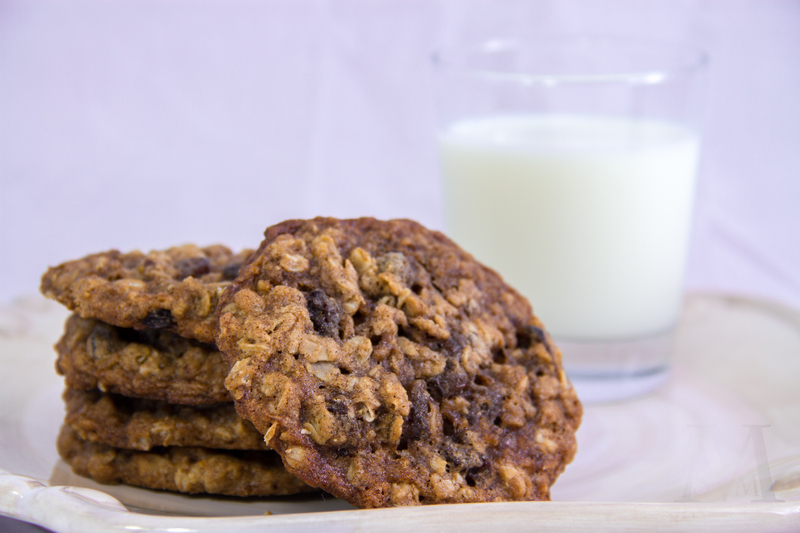 The flavors of cinnamon and vanilla come through, but not too strongly, and the cookies are just a bit saltier than most cookies–a feature that I happen to love, since a hint of saltiness pairs so well with the nutty oats. While I was still scooping the dough balls my dad sniffed the air and asked what I was baking–they’re that aromatic! When they actually were baking, my house smelled heavenly. Like cinnamon-raisin-vanilla-buttery goodness. 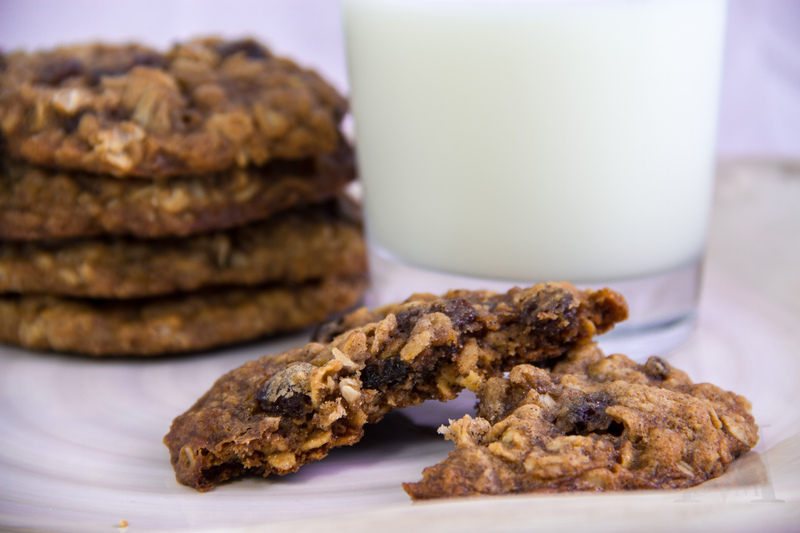 Bring oatmeal-raisin cookies out of the sidelines by baking these ULTIMATE oatmeal-raisin cookies! I still love my trusty old Quaker Oats recipe, but I have to admit that after trying these beauties it will be hard to go back. Place the raisins into a bowl and cover with hot water. Let them soak for 20-30 minutes so that they can rehydrate and plump up. Then drain the raisins and spread them onto a clean hand towel, blotting gently to soak up any extra water. In a medium-sized bowl, whisk together the flour, cinnamon, baking soda, and salt. Set aside. In a larger bowl, using an electric mixer, beat the butter until smooth and creamy. Add in the sugars and beat for 3-4 minutes or until light and fluffy. Split the vanilla bean pod down the middle and, using a butter knife or a spoon, scrape the seeds into the bowl. Add in the vanilla extract and eggs; mix until smooth. Add the flour mixture in two additions, mixing just until incorporated. Stir in the oats and raisins. Cover the dough and refrigerate for at least 30 minutes. When ready to bake, allow the dough to sit at room temperature for 10-15 minutes while you preheat the oven to 325 degrees F. Line two baking sheets with parchment paper or silicon liners. Scoop the cookie dough into balls about 3-tablespoons large and drop onto prepared cookie sheets 2-3 inches apart. Bake for 17-18 minutes, rotating sheets halfway through, or until edges are set but tops are still puffy. Let the cookies cool for 5 minutes on the sheets before transferring to a cooling rack.